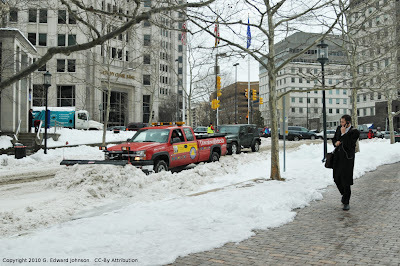 This morning they were finally working on some of the really bad roads in downtown Bethesda, MD. Montgomery Lane between Woodmont Ave and MD-355 was temporarily closed while the plowed, sanded, and salted it. Old Georgetown Road between MD-355 and Woodmont Ave was also getting some love. 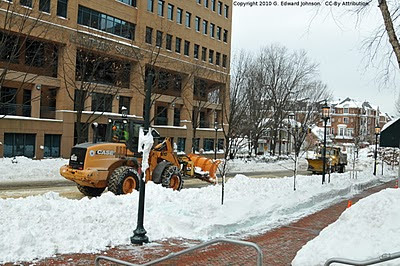 This time by the Bethesda Urban Partnership plow. There were also half a dozen Bethesda UP people shoveling the sidewalks at that intersection. Local businesses fund BUP and I think their money is well spent. The past couple of snow storms I have seen a lot of their crews working on the sidewalks near intersections. Other areas still need attention. Southbound Old Georgetown Rd between Arlington Road and Woodmont Ave is still only a single lane and Wisconsin Ave is still a mess of snow and slush.